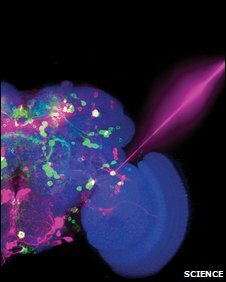 Laser-controlled flies may be the latest addition to the neuroscientist's tool kit, thanks to a new technique. Researchers have devised a way to write memories onto the brains of flies, revealing which brain cells are involved in making bad memories. The researchers said that in flies just 12 brain cells were responsible for what is known as "associative learning". They describe their findings in the journal Cell. Associative memories are made when an animal learns to link a cue to a particular outcome. It might for example learn that a certain odour is a sign that a predator is nearby. "So the appearance of that odour predicts that something bad is going to happen," explained Gero Miesenbock from the University of Oxford, UK, who led this study. Previous research had already identified that the brain cells or neurons responsible for this type of learning are those that produce dopamine. This is a chemical which acts as a signal that can be transmitted from cell to cell in the brain. Professor Miesenbock and his team "tapped into these gene regulatory mechanisms" of the neurons - programming them to respond to a laser. They modified the neurons by adding a sort of trigger, or receptor, to each one. This receptor was activated by a chemical called ATP. "Since there's no ATP floating around in the fly's brain, the [modified] receptors remain closed and the flies behave just like normal flies that don't have the receptor," said Professor Miesenbock. Now for the laser-activated trickery. 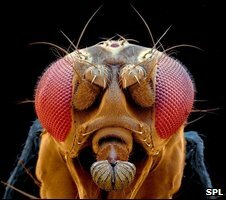 The scientists injected ATP into the flies' brains, in a form that was locked inside a light-sensitive chemical cage. "[Then] we turned on the laser light and the light sensitive cage fell apart," Professor Miesenbock explained. "The ATP was released and acted only on the cells [with] the receptor." The laser flash was paired with an odour, which allowed the scientists to find out if their memory-writing experiment had been successful. They gave the flies a simple choice between two odours - one of which the flies had been exposed to just before the laser flash. "[The flies] moved along a narrow chamber and at the midpoint they were presented with an odour on the left and an odour on the right," said Professor Miesenbock. He knew that the laser had successfully written a bad memory into the fly's brain when the insect avoided the odour that had been paired with the laser flash. The flies associated the smell with a bad experience, so the laser flash gave the fly a memory of a bad experience that it never actually had. Simply by looking inside the flies' brains with a microscope, the researchers were able to narrow this memory formation process down to just 12 neurons. "We labelled the cells .... that were made responsive to light and which ones were not, so by elimination we could narrow it down." This finding, said Professor Miesenbock, has begun to unravel how animals and humans learn from mistakes and how "error signals" drive animals to adapt their behaviour. "In the fly we have isolated and manipulated these error signals, so what we can now do is try to understand how these signals are calculated in the brain and how this works mechanistically. "I have every expectation that the fundamental mechanisms that produce these error signals are the same in the brain of the fly as they are in the brain of the human. David Shepherd, a neuroscientist from the University of Bangor in North Wales described the study as "a fantastic piece of work". Professor Shepherd, who was not involved in this study, told BBC News: "We have known for years that flies are capable of sophisticated behaviours such as learning and memory. We have also been able to manipulate gene and cell function in flies. "This work combines these elements to make a real breakthrough in our understanding of how memories are formed."